Not that we need any additional excuse to make our way into Target but Target is very much on point lately with their curated selection of home decor! No matter what I walk into Target for, I always find myself wandering over to the Home and Kitchen departments. Sure, Joanne and Chip Gaine’s Hearth and Hand line might be the mecca of all things home, (thanks to the recent Target store renovations!) but I really have taken more notice in other emerging home brands and collaborations lately! Exclusive to Target, Threshold hands down offers the the largest selection of home offerings. With updated classics in bedroom, kitchen and decor, there is always something worth adding to your shopping cart! Whenever I am in need of new white serving wear or wood cutting boards, Threshold is my go-to! A green thumb I do not have but I still swoon over the Smith and Hawken line. We used to have a free standing store nearby that I loved to browse through, but it has now since closed. Now Target provides my fix with this collaboration! And there are plenty of wonderful finds outside of gardening! Who couldn’t use all the vacation vibes right now? Enter Opal House that offers inspiring wanderlust objects of rattan furniture, bright baskets and colorful accents! Decor with a modern edge, there is a California lifestyle influence in their home accessories. And since I can’t live there, I love to add a little Cali style to my home whenever I can. This line’s assortment of vases are a favorite of mine. When someone is just so stinking cute and you love watching her empire grow, you get giddy when she launches a kitchen and tabletop collection at Target!! Her cookbook, “Cravings: Hungry for More” is a must if you do not already own it! I bought it right after my girlfriend served her corn souffle recipe at a dinner party. Equally delightful are her curated objects for your kitchen! 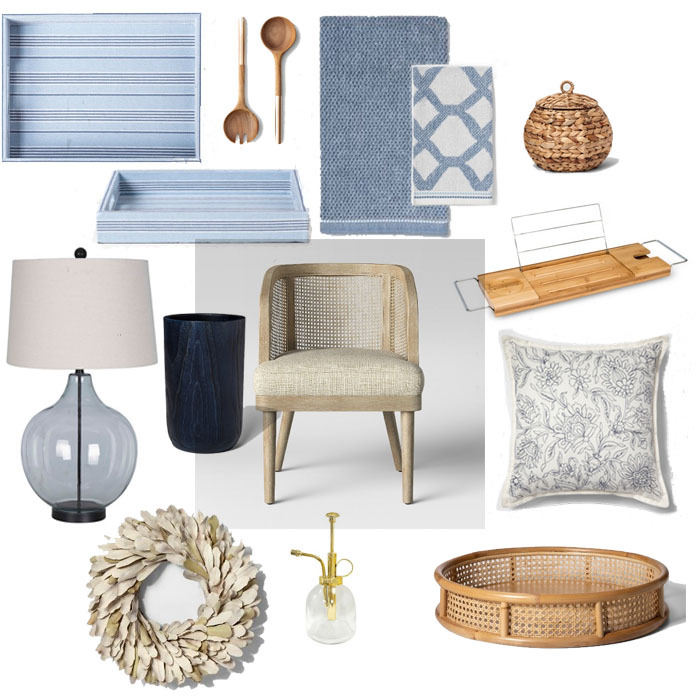 Just about every product I rounded up,I have seen and felt in the store. The quality is so good and the price point even better! I could dedicate a whole post just on all the storage baskets I find and love, so take a look at the widget below with additional favorites! Also, the quality of their linen throw pillows right now is exceptional. These ones do not photograph well on-line but they are divine! If a product is not available for shipping , you can always do a local store check, buy it on-line and pick it up at customer service! I shop this way so often!